"This is a breakthrough that will help scientists do a better job of modeling the ocean ecosystem of the future," said Gwenn Hennon, a Lamont-Doherty postdoctoral research scientist and lead author of the paper, which was published Tuesday in the ISME Journal. The study builds on 2015 work by Dutkiewicz et al., which concluded that vast swaths of the ocean where Prochlorococcus now dominates may dramatically change due to high carbon dioxide levels and ocean acidification; Hennon's finding reveals one of the potential reasons why. "What's striking about Gwenn's study is that it's the first time we've been able to show mechanistically how elevated carbon dioxide influences the relationship between these microbes," said Sonya Dyhrman, a Lamont-Doherty microbial oceanographer and a co-author of Hennon's paper. "We know Prochlorococcus needs helper bacteria or it doesn't grow well, but now we are able to see how this partnership breaks down in future ocean conditions." Prochlorococcus is the smallest and most abundant photosynthetic organism on the planet: about one million cells fit in a teaspoon of seawater. Although the microbes are minuscule, they have an outsize role in the maintaining the health and productivity of the global ocean. Prochlorococcus forms the base of the marine food web, serving as an important food source for slightly larger single-celled organisms, which are consumed by species in higher trophic levels. The microbe also has a crucial role in the global carbon cycle, helping to regulate Earth's climate by trapping carbon dioxide, moving it through the food web, and down into the deep ocean. Prochlorococcus is able to thrive in the nutrient-poor conditions found in the vast regions of the open ocean due to microbial helpers like Alteromonas, which takes care of some activities tiny Prochlorococcus can't perform on its own. To better understand the partnership between Prochlorococcus and Alteromonas, Hennon and her colleagues grew the microbes together in the lab under the concentration of carbon dioxide in the atmosphere today, 400 parts per million. 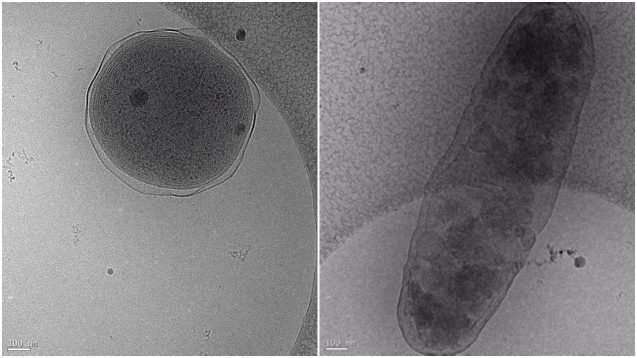 They found the microbes co-existed in the same way they do in the surface level of the ocean. Alteromonas enabled Prochlorococcus to flourish by cleaning up excess hydrogen peroxide, a "free radical," or unstable molecule that causes cell damage. Prochlorococcus lacks the gene catalase, an enzyme that destroys the toxic build-up of hydrogen peroxide, so it relies on bacteria like Alteromonas to perform this service. The researchers then used their thriving microbial community to examine how the organisms would interact in a high-carbon dioxide world with more acidic oceans. When Prochlorococcus and Alteromonas were grown under 800 parts per million—the amount of carbon dioxide expected to be in the atmosphere by 2100—Prochlorococcus had a greater mortality rate and appeared to have more free radicals. But the surprise was how Alteromonas behaved toward Prochlorococcus. "Under higher levels of carbon dioxide, Alteromonas doesn't provide the same level of ecosystem services. It begins to have a more antagonistic relationship with Prochlorococcus," Hennon said. Hennon and her colleagues tracked gene expression and other activities to examine what changed for the microbes grown at 800 parts per million. They found that Alteromonas turns down its catalase "helper" gene and, at the same time, turns up a gene that increases the free radicals surrounding it. Prochlorococcus is unable to get rid of the toxins, which puts stress on the cells. Hennon says Alteromonas may also hasten the demise of Prochlorococcus by moving toward the organisms as they begin to die and consuming their disintegrating parts. "If no other bacteria steps up and fills the important, helpful role of Alteromonas, this change in interaction could have a profound effect on Prochlorococcus growth, abundance, and activities in the future ocean," she said. "When you're talking about an organism that dominates the global ocean, that's a significant change for the ecosystem." There is an upside to the glimpse of the future provided by this study. As scientists improve their knowledge of interspecies interactions in the sea, they'll be better equipped to predict what the ocean will look like at the end of the century. "This study is really a wake-up call," Hennon said. "We need to do a better job in including information like this in models to understand how the global carbon cycle, ocean ecosystems, and fisheries might change in the future. If we don't do this work now, we'll be blindsided in the future by these ecological changes." Video: How will climate change impact ocean health?